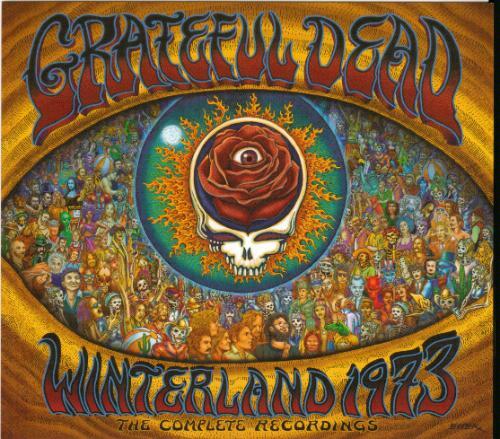 Winterland 1973 documents an intriguing evolution in the presentation of Grateful Dead music. Just as cassette tapes replaced the LP record as the natural mode for listening to the Dead because 20-minutes-to-a-side albums were too short, archivist David Lemieux is introducing the Grateful Dead vault release program to the same progression that Dead Heads made long ago--approaching the band's music not in the form of a set or a night, but of a run. The Fillmore West box began this process, and now we have the three nights of November 9, 10 & 11, 1973, at Winterland Arena in San Francisco. That in itself is of interest, because that year the Dead played just this one weekend at Winterland, their home sweet home, and only two other shows in the whole Bay Area (February at Stanford's Maples Pavilion, and Kezar Stadium in Golden Gate Park in May). Their attention was focused elsewhere about which more later. There are a number of differences between this and the FW box. This is a two-track release; although they're going to be the best sounding two-track recordings you'll likely ever hear (see tech notes later). It's not based on a classic live album, but rather a period of exceptional performance--Lemieux argues quite seriously that the fall of '73 is among the finest sustained seasons in Dead history. More importantly, this is the modern Dead. Most of the songs they play here ("China Cat" and "Dark Star" are obvious exceptions) date back no more than two or three years, and they are tunes that the band would return to throughout its history. By 1969, they had created the suite that contained "Dark Star," "St. Stephen," and other tunes from Anthem and Aoxomoxoa, and ended in "Lovelight." It gave them their musical identity, and night after night they played variations on the suite in as experimental and risky a manner as they could manage. It was an extreme position to take, and one that they could not maintain forever. As 1969 passed, Hunter and Garcia's songwriting partnership blossomed, and the songs that would become Workingman's Dead emerged. And so the band morphed. Actually, they did that every night--that's what you get when you're truly committed to improvisation--but some enduring patterns would emerge. It's not as though they turned on a dime and dropped the psychedelic thing for something more commercial. Instead, they added; they grew. The acid-drenched Live/Dead material and persona gave way to something that still included psychedelia (oh my lord yes, just you wait) but also, for instance, straight-up country-western. For my money, two of the major musical peaks in this box are 1) the band's three performances of "Big River," in which Bill Kreutzmann, Bob Weir, and Jerry Garcia each contribute playing that could have earned them places at the Grand Ole Opry, and 2) the Saturday night jam of "Playing In the Band"--"Uncle John's Band"--"Morning Dew"--"Uncle John's Band"--"Playing In the Band," which is as psychedelic as you could ever want. The Sunday "Dark Star" wins honorable mention, and may very well be better. Has there ever been a band that could cover so incredibly broad an expanse of musical territory? 1973 was the fruition of a four-year period going back to those first Workingman's songs in which they'd integrated a wonderful array of music, and were comfortable with it all. The Hunter-Garcia chemistry that had produced Workingman's was so potent that it spread out to include Pigpen ("Operator"), Lesh ("Box of Rain") and Weir ("Truckin'" and "Sugar Magnolia") in American Beauty, which hit stores in November 1970. Early in 1971, Mickey Hart retired from the road. The result was a leaner (one drummer, minimal keyboards), more nimble if not so powerful band that is documented by the album affectionately called Skullfuck. As always, the year was one of many changes, not only within the Dead's immediate world but also without. Bill Graham closed down both the Fillmore East and Fillmore West, and though he certainly wasn't going away, the Dead had lost their two comfortable home bases. Which meant that they had to grow up and out, playing colleges and developing a following in places off the two coasts. Garcia began to expand musically outside the Dead, too. In 1970 he'd begun a series of Monday night jams with a keyboardist named Howard Wales at a tiny San Francisco club called Matrix. It was genuinely odd, "outside" music, but it somehow began to pick up an audience, whereupon Howard made tracks for elsewhere, to be replaced in 1971 by Merl Saunders. Garcia also spent part of that summer recording Garcia, his first solo album. The title shows no imagination, but the songs--"Deal," "Bird Song," "Sugaree," "Loser," "To Lay Me Down," "The Wheel"--were gems, and he'd play them both solo and with the Dead for the rest of his life. That fall, a beautiful woman named Donna Jean Godchaux introduced herself to Garcia at one of his club shows with Merl and announced that her husband, Keith, was the new Dead keyboard player. She proved quite correct. Along with a new pianist, the band had lots of good new material. Earlier that year, they'd added Garcia's up-tempo "Bertha" and his ballad "Wharf Rat," plus Weir's huge new jam vehicle "Playing In the Band," and his own rocker "Greatest Story Ever Told." As Keith's first tour progressed (actually, it was on the first night of the tour! ), they broke out what would have been a solid start on a whole new album, except they were too busy to record it: "Comes A Time," "Ramble On Rose," "Tennessee Jed," and "Jack Straw," plus "Brown-Eyed Woman" from a month or two before. All told their creativity was very strong. So they went on a semi-vacation. Early in 1972 they went off to Europe, wives, babies, family and all. It wasn't a normal tour-- they only averaged a show about every three days--and it wasn't just a vacation, since they were playing at a remarkably consistent and very high level. But some of their attention went into explorations of things like Stonehenge, and with the exception of "He's Gone," there were no new songs. Which is perhaps why by the time 1972 ended and they rolled into '73, they were energized by two fantastic new adventures. One was the idea of starting their own record company. In the end, they were overwhelmed by the challenge. But through 1973, it seemed an incredible opportunity to answer the question, as the company's production coordinator, Steve Brown, put it, "If Dead Heads had their own record company, what would they do? We really believed in it." So, for instance, engineers Bob Matthews and Betty Cantor would go to pressing plants and make sure that the vinyl was first quality, while the company's primary marketing method was developing their Dead Head relationship with mailings and a tie-dyed booth at shows. Business-wise, it had aspects that closely resembled jumping off a cliff--at one point, the president of the record company, Ron Rakow, talked about selling records from an ice cream truck--but the Dead had been jumping into the void for years, so that was an attraction. As Rakow put it, Jerry "liked my desire to have a lot of random events going on." They recorded their first album for their own company, Wake of the Flood, in August 1973 and released it on October 13th, just three week before the shows in this box. The other inspiration of 1973 was a serious expansion of their commitment to research and development on their instruments and sound system. This had roots going back to Owsley's weirder experiments from 1966, but now there was much more going on. The size of their shows had grown dramatically in 1972, which meant they had somewhat more money to work with, a lot of which went to finance research. The first gig of 1973 was a perfect sample of their quest--and the challenges. They'd spent maybe $20,000 on new amps, recalled Dan Healy, and in the first two seconds of the first song, wiped out every one of them. A few sound-guy magic tricks got them through the show, but that was only the beginning of the year's tech work. As the audience size grew, the sound crew, Alembic, followed an unusual philosophy, instead of simply adding more power, they added more channels; instead of just making things louder, they made them more complicated and sophisticated. As the year passed, they used architectural drawings and plots to analyze room acoustics (they even advised some buildings, like the Springfield Civic Center, on how to improve their sound). Alembic worked on the instruments, as well. Phil's new bass, for instance, was the first quadraphonic bass ever made. Each string had a separate signal. On each of the bass and treble pickups there were five controls, which enabled him to select 1) the bandwidth of the filter, 2) the center frequency of the filter, 3) the kind of filter he used, 4) how much of the filtered sound reached the speakers, and 5) to mix the unequalized and unfiltered direct sound. By May, Alembic was working on ten different projects, including a differential condenser microphone, a pre-amp for dynamic microphones, a monitor mixer, and the PA array itself. All of that contributed to the sound at the summer's Big Event. On July 28, 1973, the Dead (along with the Allman Brothers Band and The Band) played in front of around 600,000 people at the grand prix racetrack in Watkins Glen New York. The dimensions of the event were amazing. Given that it was the largest rock audience in history and the fact that the Dead didn't really love the pressure of that kind of super-spotlight… they played OK. But they'd been part of something almost unimaginable, and that added further juice to a band bursting at the seams with creativity and vigor--Garcia, for instance, had spent the spring shuttling among three different bands (bluegrass with Old and in the Way, funk with Merl Saunders, and the Dead), happy as a pig in mud. There was another important element in their lives as they went into the studio a month after Watkins Glen to begin Wake--the death in March of Ron "Pigpen" McKernan. If ever there was a sign writ large across the heavens that the old Grateful Dead was gone, succeeded by something connected but different, that was it. For a while, Garcia even considered quitting the Dead. Pigpen's absence certainly added sorrowed depth to the recording of Wake. To quote critic Mary Eisenhart, the album was about "mythic journeys, the cycle of the seasons, death and rebirth, a good hard look into the dark unknown… but with an indominitably light heart." The material had been mostly broken in, but was still fresh. They'd introduced "China Doll"--aka the Suicide Song--"Eyes of the World," and "Here comes Sunshine" in February, "Mississippi Half-Step" and "Stella Blue" had made their debuts in 1972. And--at the last second, pretty much as usual--Weir's huge contribution, the full "Weather Report Suite," came tumbling out in September just days after they finished recording it. Although the material--especially "Eyes," "Stella Blue," and "Weather Report"--was first rate, Wake turned out to be only a very good album. The pressure they put on themselves to be responsible record company owners might have affected their focus as musicians. Certainly they rushed it a bit, recording the album in under a month. But the songs were there, and they took the stage on November 9th ready to rock. What these shows demonstrate--taking nothing at all away from Garcia, Kreutzmann, Lesh, and the Godchauxs--is that Bob Weir had become a co-equal singing partner to Garcia and, with his new partner, John Perry Barlow, a very special composer. Friday's first set highlights include his "Black-Throated Wind," his performance on the transition from "China Cat" into "I Know You Rider," and the set closer "Playing In The Band." It seems to me that they're pacing themselves a bit; the second set is full of superior playing, but no one epic moment of over-the-cliff delightful madness. The linchpin is Weir's shiny-new "Weather Report Suite." Later he'd dismiss it to one writer as "licks that I've copped from Villa-Lobos, and Abanez, and Miles Davis, and various Mexican artists that I've heard. Mariachi bands. And it's maybe at best a clever amalgam"--but it's quite a lot more than that. Weir was an ambitious composer (not in an ego sense, but in his desire to write something truly distinctive and original), and "Weather Report" is the first time his ambitions are realized. Friday's second set goes from there to "Eyes" and then "China Doll," then into three or four rockers to wind down quite a good show. Saturday night's the night, though. The band ends a wonderful first set with an exquisite "Weather Report Suite," takes a breather, and comes back flying; "Playing In The Band"--"Morning Dew"--"Uncle John's Band"--"Playing In The Band." Simply unfreakingbelieveable playing, graceful as a dance, sharp as a razor, powerful as thunder. And because this was 1973, and they frequently seemed to not know how to stop playing--ah, youth!--they threw in another hour of great music, including "Stella Blue," "Truckin'" and on and on. Quite amazing. So they maybe top it on Sunday. The first set again ends with "Weather Report Suite," probably the best of the three versions, and in the second set they go into a 35-minute "Dark Star" that's actually "Dark Star" only a part of the time. They rest of the time it's "let's listen to the Grateful Dead reveal their souls through their instruments." In March, Patrick Carr had written in the New York Times that "The Dead had learned how to conceive and perform a music which often induced something closely akin to the psychedelic experience; they were and are experts in the art and science of showing people another world, or a temporary altering (raising) of world consciousness. It sounds pseudomystical pretentious perhaps, but they fact is that it happens, and it is intentional." The two-track 1/4" tapes were originally recorded on a Nagra IV running at 7.5 inches per second by Bill "Kidd" Candelario as part of the normal tape documenting done in 1973. Kidd employed a mic split which permitted a different mix to tape than that to the PA system, with minimal processing allowing the clearest possible signal path to tape. We have attempted to preserve this excellent recording by using current technology to enhance its fidelity as never before. The first step in this process was to transfer the original analog master tapes to a digital format. This was done by using a Pacific Microsonics HDCD A/D converter at the highest possible digital resolution, 192KHz/24bit (for comparison, a standard CD is 44.1KHz/16bit). The resultant audio files were then sent via hard drive to Plangent Processes in Nantucket, MA. Plangent Processes utilizes a novel proprietary digital signal processing system called Clarity. The process analyzes the tape, searching for artifacts of the recording stream that happen to contain highly accurate timing information, which then reveal the mechanical imperfections of the original tape recorder's performance as it was making the initial master recording. To obtain this timing information, the original transfers to digital actually had to be done with the master tapes running at half speed, 3.75 inches per second. This information was then employed as a guide to gently but firmly correct the data of the digital transfer such that the sonic performance in terms of speed, pitch and tempo was indistinguishable from the board output. In this case the original 7.5 inches per second recordings contained significant amounts of wow and flutter, as would be routine even in the professional machine used to make these recordings. By undoing the wow and flutter we can now hear the performances in their original perfect pitch, and with steadiness of rhythm and overall clarity intact. The performances were then mastered from these corrected audio files. Slight amounts of analog compression (through a Fairman Tube Master Compressor) and equalization (through a very phase-coherent NTI EQ3) were employed when loading into the Sonic Solutions digital workstation for final assembling and editing. We are confident that you will find this reproduction to sound better than any two-track recording of this vintage you may have previously heard. This massive album was released in March 2008.